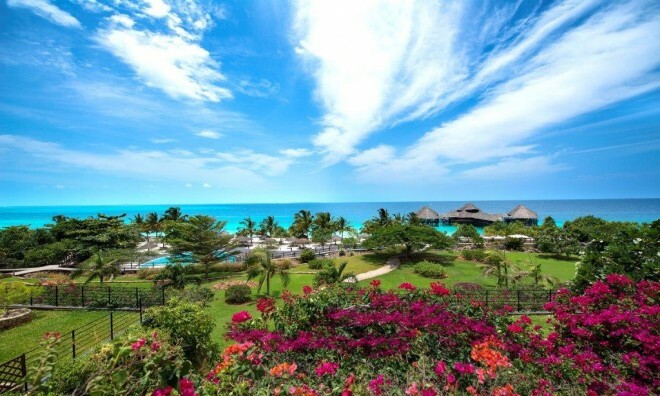 Set within exotic tropical gardens and water features, this Zanzibar resort invites guests to enjoy their pristine view over the Indian Ocean. 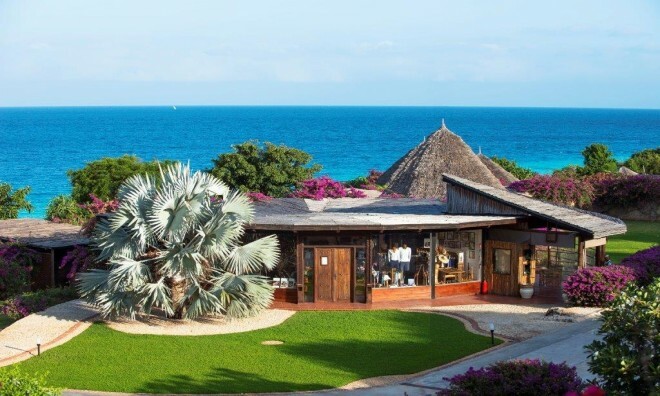 Diamonds La Gemma Dell' Est is located on the northern shores of the enchanting spice island of Zanzibar. 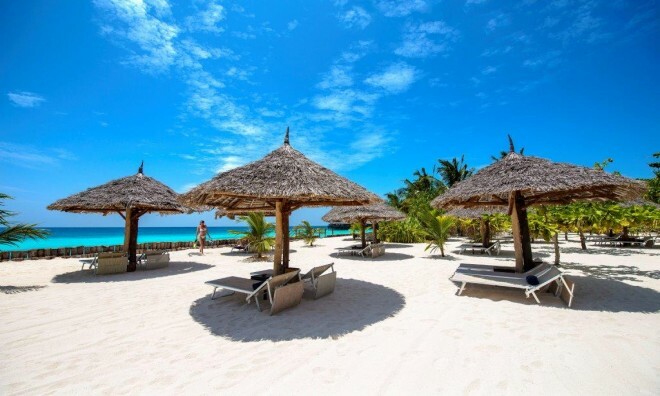 This captivating, environmentally friendly and luxurious resort in Zanzibar is famous for its splendid beach and large wharf built onto the open waters that stretches out towards the sunset. There are 138 modern and comfortable rooms designed for the most discerning traveller at this luxury north coast resort, including 93 deluxe sea view rooms with private terrace and garden access, 16 sea view suites with separate living room and kitchenette and 1 family suite with living room, kitchenette and 2 bedrooms. 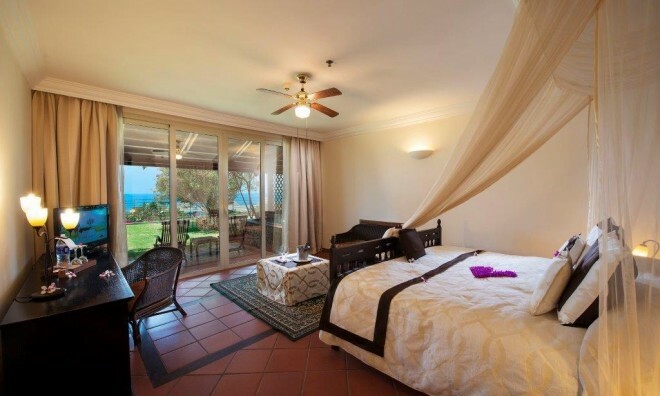 There are also 23 villa club rooms with complimentary laundry and butler service. 1 Presidential suite with 5 bedrooms, large communal living area, office, butler's quarter and large private salt water swimming pool with sea view terrace. Welcome cocktail, Breakfast, lunch and dinner served at the main restaurant, Soft drinks, fruit juices, beer, house wine, tea and coffee and selected spirits, Snacks and tropical fruit offered at the beach bar throughout the day, Pizzeria Restaurant open for dinner, Caffe' Moresco open in the evening, Wireless Internet connection in public areas, Gym facilities, tennis court, canoe and table tennis, Beach towels, sun beds and beach umbrellas. King size or European twin beds with mosquito net, Individual climate control and ceiling fan, TV with satellite channels, Daily stocked mini bar with coffee and tea making facilities, Digital in-room personal safe, Large en suite bathroom with wash hand basin, walk-in shower and WC. 24 hour reception with concierge and luggage store room, Business centre, Laundry and pressing with valet service, In house clinic with doctor on call, Saltwater pool with children's area, Babysitting service, Mvua African Rain Spa, Spherique fashion boutique, Baobab Multi Media Congress Centre, Water sports, diving centre and tennis court with flood lights. With indoor and outdoor dining facilities, it offers lavish buffets with a fusion of Mediterranean cuisine and favourite local dishes. 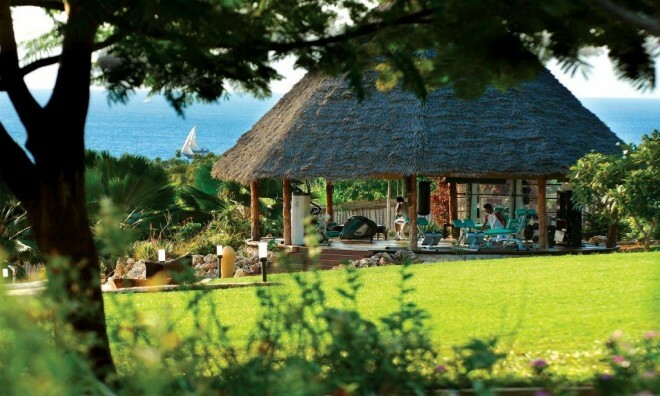 Serves all inclusive breakfast, lunch and dinner. Situated on the beach serves pizzas, salads and drinks. 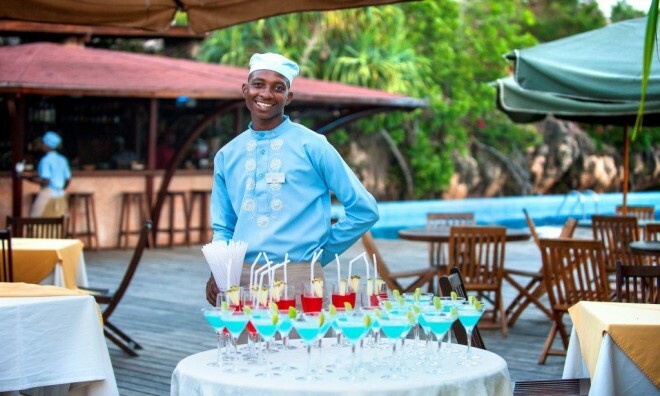 Situated on the magnificent wharf of this Zanzibar hotel, it serves an exceptional Ã la carte menu featuring fresh seafood and meat specialities in a romantic and refined ambience. 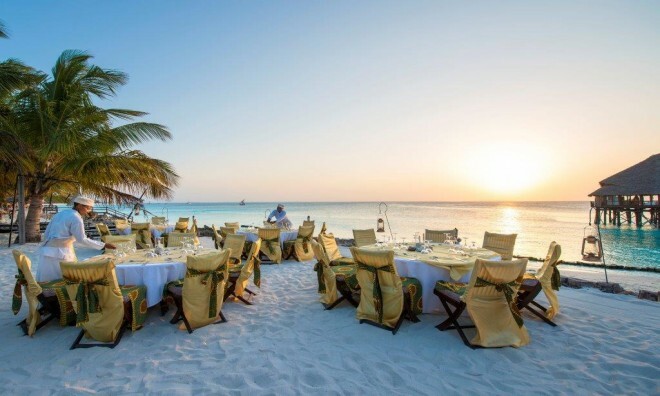 Serves excellent seafood menu in a unique and private setting on the beach. Situated on the wharf and open just before sunset, it serves Oriental coffee and tea's, shisha, snacks and pastries and a wide selection of local and international cocktails and drinks with live entertainment and local shows. 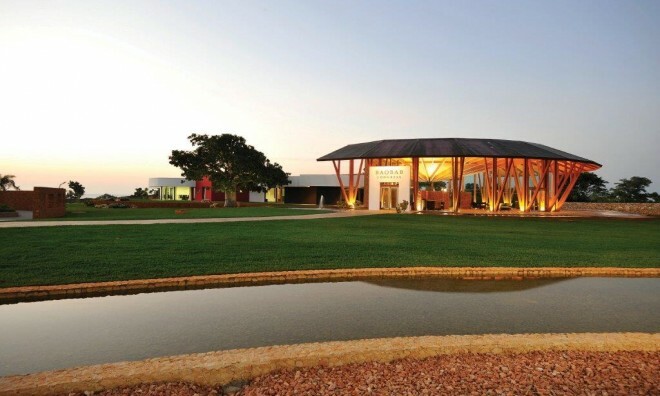 Built around 2 monumental baobab trees, the centre at this hotel in Zanzibar caters to all conferencing, meeting and banqueting requirements. Event planning and catering services are available along with premium table settings, meeting amenities and modern audio-video equipment. Transportation service to and from Stone Town, Big Game Fishing, Sightseeing and excursions, Spice tours, Safaris to Tanzania. 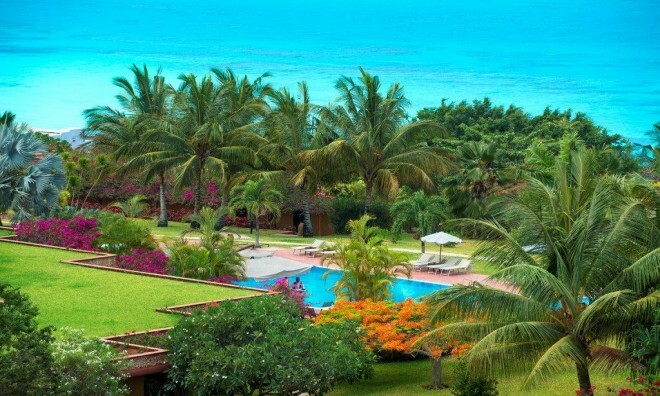 Spend your holiday in Zanzibar at this luxury resort to experience the finest accommodation on this spice Island. Why not share your experiences and reviews with the community and write a review for Diamonds La Gemma Dell'Est.